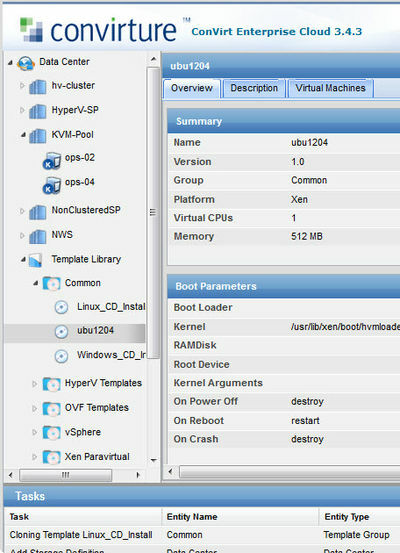 5.3 Delegate Cloud Resources Via A "Virtual Data Center"
This document walks you through many of the key features of ConVirt. 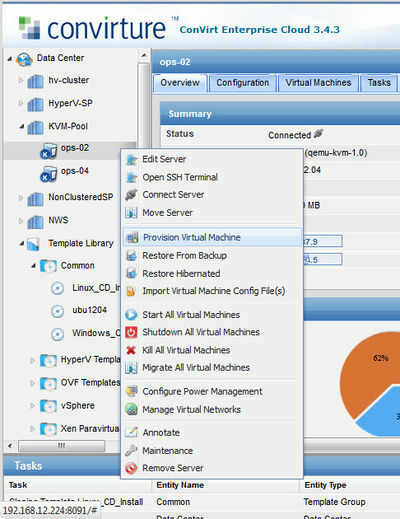 The assumption is that you have already installed and setup your ConVirt Management Server, and have a couple of KVM or Xen hosts under management. 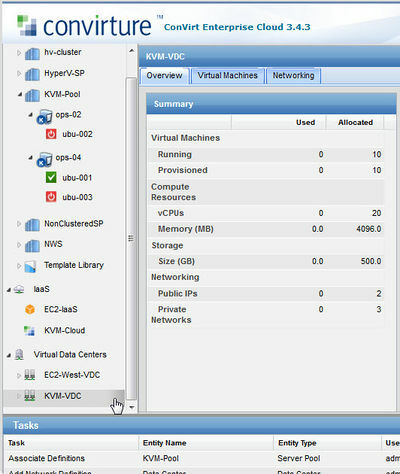 If not, you can walk through these steps in our Getting Started Guide - ConVirt for KVM and Xen. 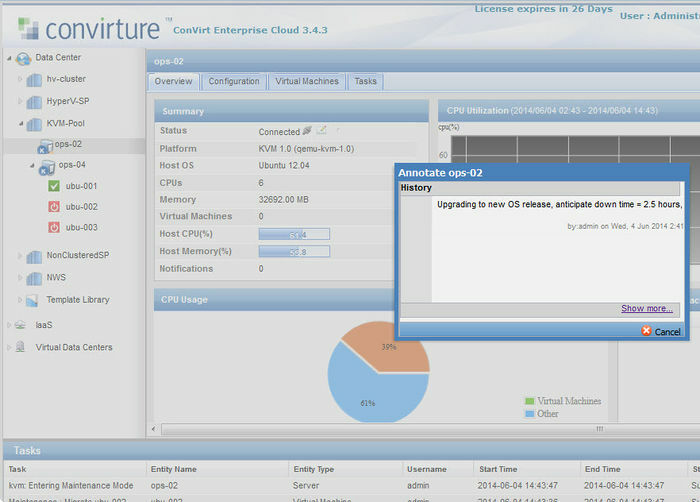 Note - this guide applies to ConVirt Enterprise 3.x and ConVirt Enterprise Cloud 3.x versions. ConVirt provides a toolset for day-to-day VM administration and lifecycle management, including templates-based provisioning, monitoring, configuration management, basic automation, live migration and much more. A template is a set of related configuration information from which you can create one or more virtual machines. ConVirt ships with a set of default templates geared towards doing an ISO install, and can be easily customized to your environment. Drill down to the Common Templates group and select the Linux_CD_Installation template. Enter a name for the new template and click OK.
You should see the new template show up in the Common Templates group. Right click on the new template, and select Edit Settings. A Template Settings dialog box should pop up that will guide you through the process of editing the template. 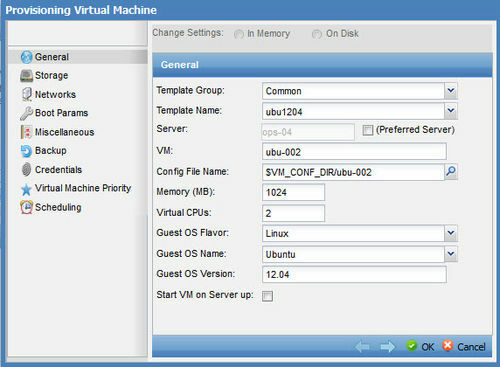 In the General section, change the default values to match your virtual machine template. 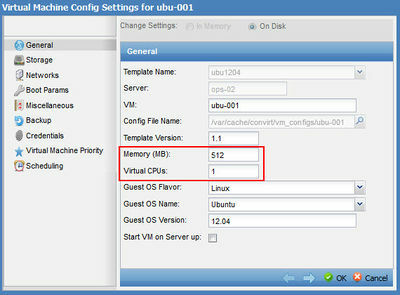 For example, you can change the memory or change the number of virtual CPUs. Next we'll modify the template to use an ISO file to create new virtual machines, rather than the physical cdrom device. 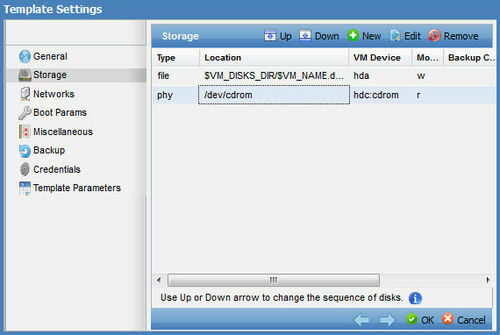 Select the Storage tab on the left, and then select the cdrom VM device. For Options, change "Use Physical Device" to "Use ISO File". For Location, search for the location of the ISO file you'd like to use for this template. 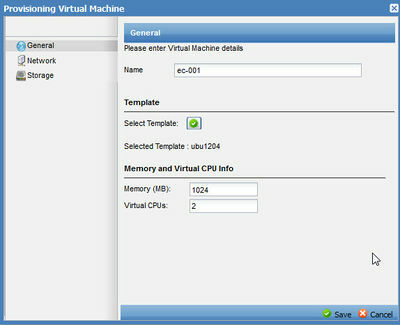 The template is now set up to use the specified ISO file to provision new virtual machines. Click OK. Revise the version if you like, then click Yes. 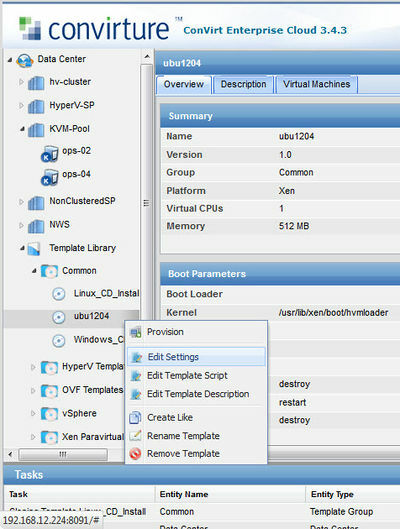 You have just created a template that is suitable for provisioning multiple virtual machines in your environment. 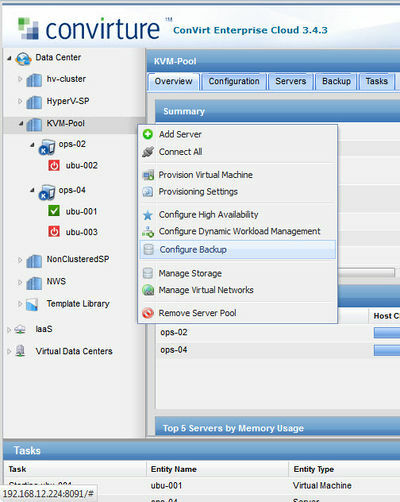 Right click on the host, and select Provision Virtual Machine. 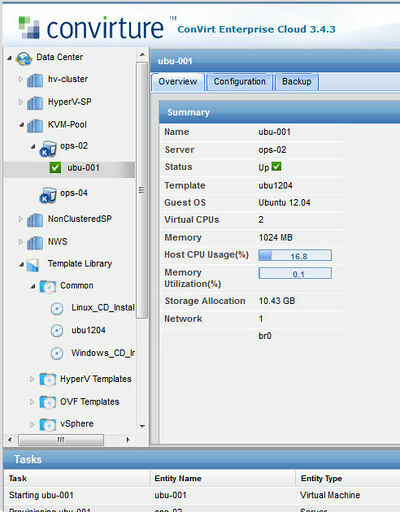 Next we will associate the shared storage with this new VM. Select the Storage tab on the left, click on the "writable" disk, and select Edit. In the Storage Details dialog, click the "shared storage" icon on the right side. 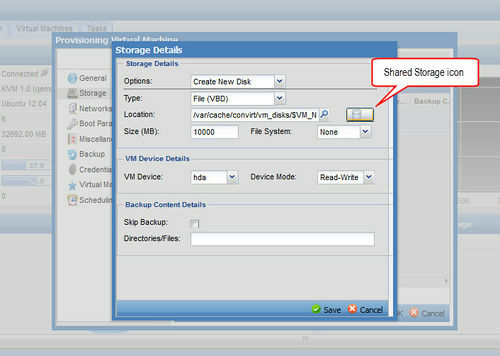 Select the shared storage that you had previously created, and click OK. The Location should be updated with appropriate location of your shared storage. Click Save. 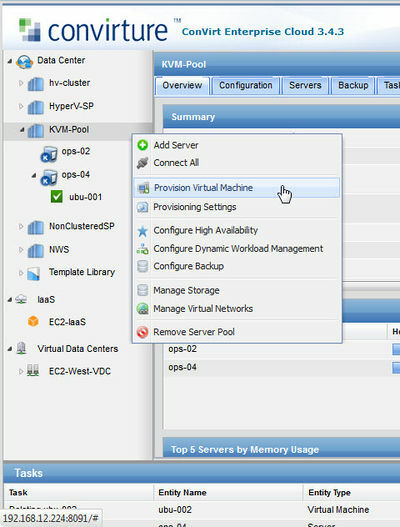 Click OK to provision the VM. If the connection is successful, you should see the new VM show up in the Navigation page under your host server. 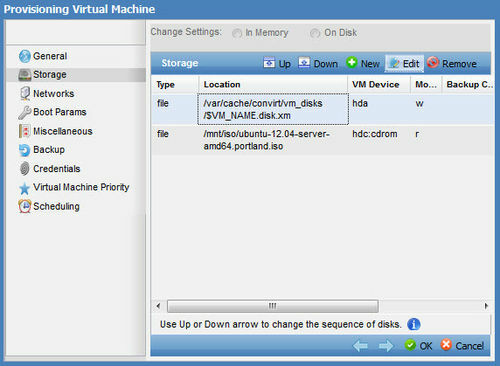 Right click on the new VM, and select Start. 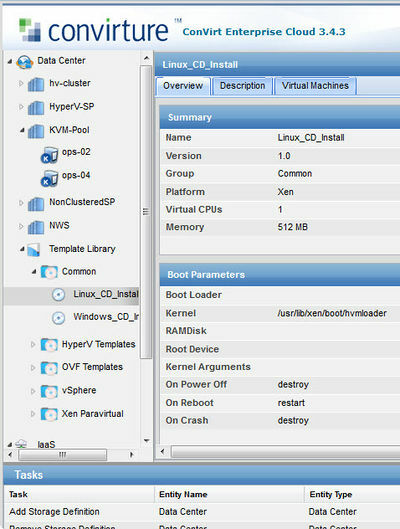 Then ConVirt opens a console window to your new virtual machine. 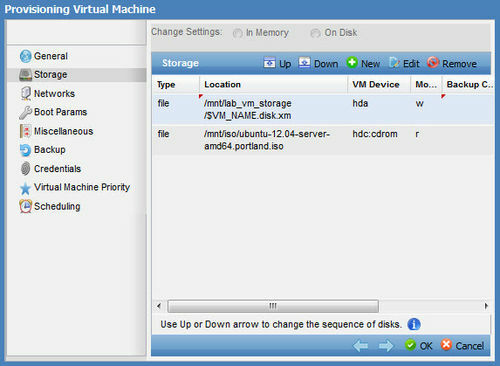 With ConVirt, its easy to change the memory, number of virtual CPUs, storage, and network resources for an existing virtual machine. In addition, we strongly suggest you use identical machines with the same virtualization platform version running. 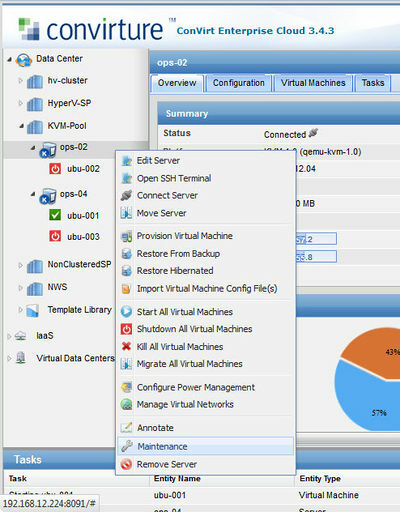 NOTE: There is also a convenient Migrate All feature to migrate all virtual machines on one host to other hosts in a server pool. This is particularly useful when a host is being upgraded or brought down for maintenance. ConVirt's monitoring and configuration management functionality enables you to quickly identify bottlenecks, re-allocate resources, and ensure compliance with corporate policies. All of the monitoring information is presented at multiple levels â individual virtual machine, host server, server pool, and enterprise, bringing the most pressing issues to your attention right away. 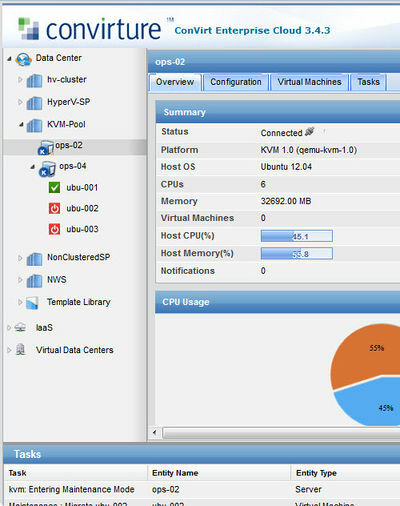 As soon as a virtual machine is deployed or a host server is added, ConVirt automatically collects a comprehensive set of availability, performance and utilization metrics for CPU, memory, storage, and network I/O. Data center-level Overview tab provides a summary of data center resources, and shows CPU utilization graph for top 5 hosts in the data center over time, with additional detail showing top 5 hosts and virtual machines. The Server Pool-level Overview shows a summary of resources at the server pool level, a graph of performance over time (memory utilization, in this case), and top 5 hosts and virtual machines for this particular server pool. The Host-level Overview shows a summary of resources at the host level, a graph of performance over time (CPU utilization, in this case), CPU usage, and top 5 virtual machines for this particular host. The Virtual Machine-level Overview shows a summary of resources at the VM level, a graph of performance over time (CPU utilization), and an audit trail of the tasks and operations applied to the VM over time. 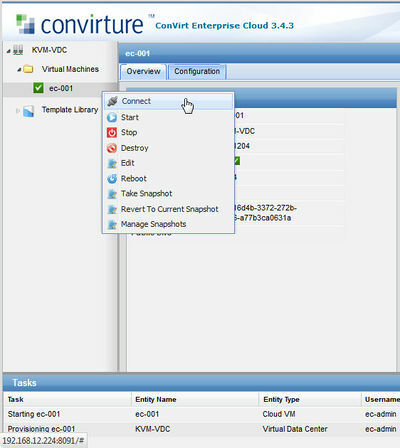 ConVirt automatically collects detailed configuration information for host servers and virtual machines. This information is aggregated at a server pool and data center level, providing you with a consolidated view of your entire environment and helping you ensure compliance with corporate policies. In particular, ConVirt tracks the relationships between virtual machines and the templates that were used to deploy them, and flags any discrepancies. The product also keeps a detailed audit trail at the VM, host, server pool and data center level, so you can answer questions like "Who shut down this virtual machine, and when?" 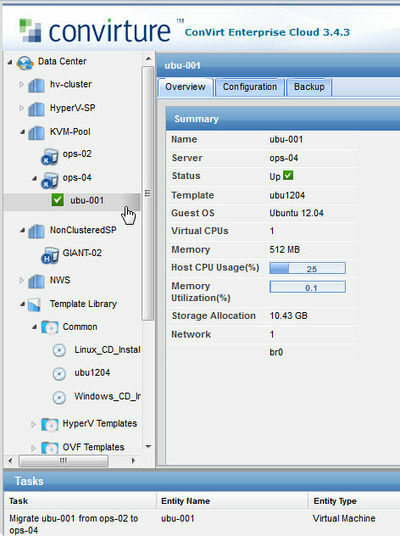 ConVirt provides configuration information at both the host and virtual machine level, including detailed information about storage and virtual networks. 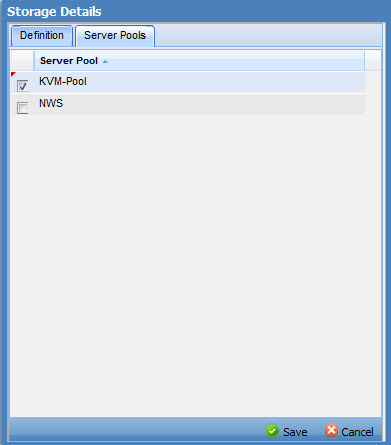 ConVirt provides a detailed tabular view of all the servers and virtual machines in a server pool. This view is sortable on any attribute, and searchable for machine names. The Tasks tab provides a detailed audit trail of all operations executed, and the data is aggregated up from the VM level to the host, server pool, and data center levels. 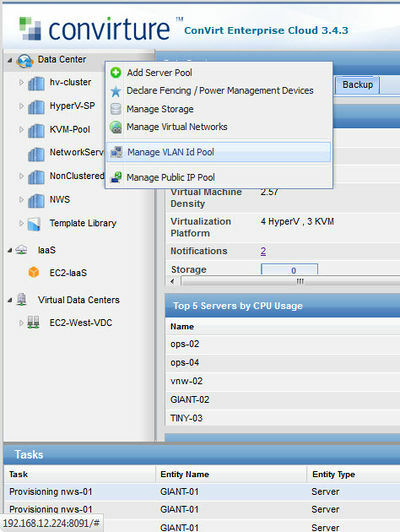 In order to take advantage of the agility introduced by virtualization, you need to uniformly manage pools of hosts according to IT policies and resource constraints. 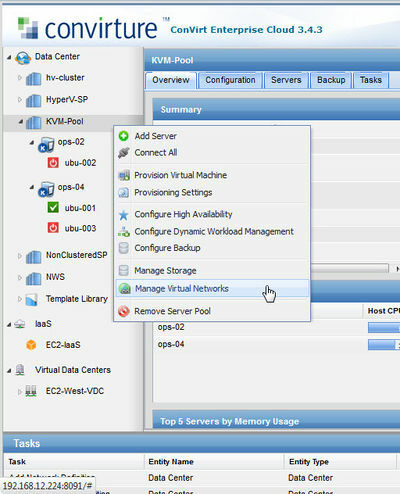 ConVirt simplifies server pool management by letting you monitor, provision, and configure virtual machines at the host and server pool level. For example, ConVirt summarizes key monitoring information across a server pool, allows you to apply pool-wide configuration and provisioning policies, and lets you associate shared storage with a pool of servers. When provisioning a new virtual machine or migrating an existing virtual machine, it is important to understand which host server is the best candidate to host the additional workload. However, as the number of servers grows, determining resource utilization across servers gets increasingly difficult. ConVirt eliminates this time-consuming and error-prone task by automatically identifying the best placement of the virtual machine within the server pool, based on performance and resource utilization. A dialog pops up for the template with a host server already selected. 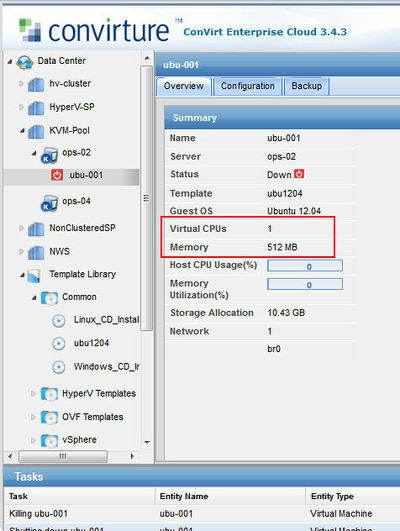 ConVirt looks at a combination of CPU and memory utilization to determine the best host on which to place a VM, and you can modify these placement rules. 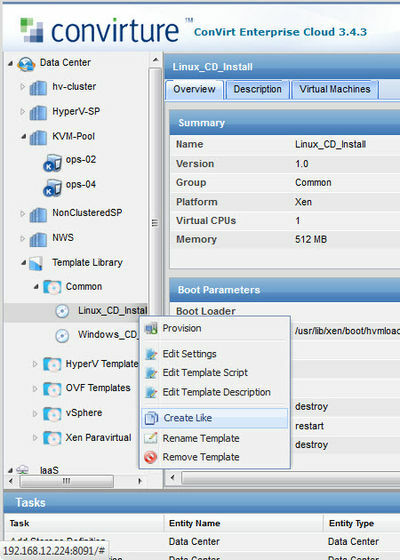 Select the Template Group and Template Name, give the VM a name, modify memory, vCPUs and Guest-OS variables as appropriate, and click OK to provision the VM. 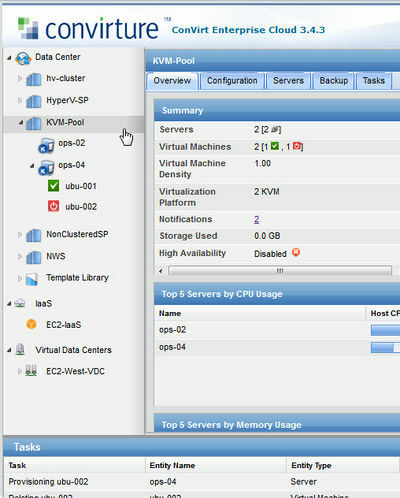 You should see the new VM show up in the Navigation page under your host server. 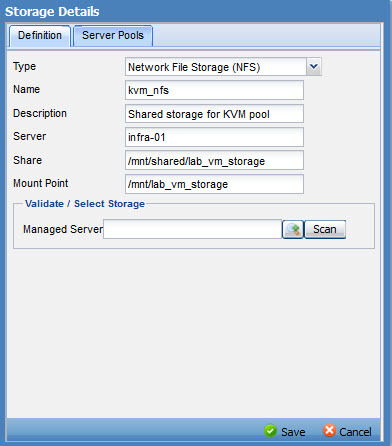 ConVirt allows you to centrally declare your storage, and share it with your server pools. 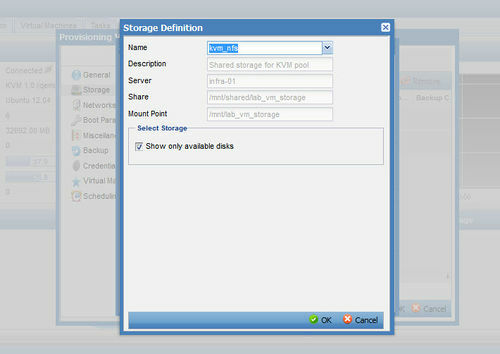 Once storage is shared, ConVirt automates the configuration and mounting of the storage on all hosts in the server pools. The first step is to create a new storage resource at the Data Center level. 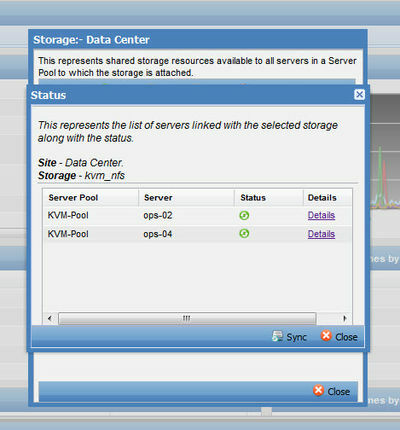 This dialog shows all the storage resources currently defined at the Data Center level (currently none). Click New to create a new resource. 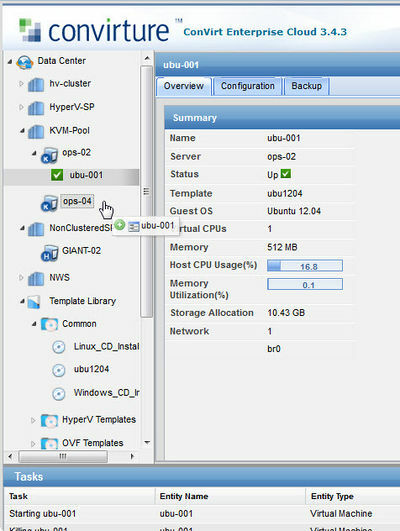 This Storage Details dialog will walk us through the process of configuring and testing a new storage resource. Select NFS from the drop down menu and specify details. The Mount Point here is key - ConVirt will automatically create this Mount Point and mount the storage on all the hosts on all the server pools where this storage is available. This is a key piece of automation you donât have to worry about any more. The next step is to validate that the storage configuration is correct and working. Convirt allows you to test this by temporarily mounting the storage to ensure that the entries are valid, and appropriate permissions exist. 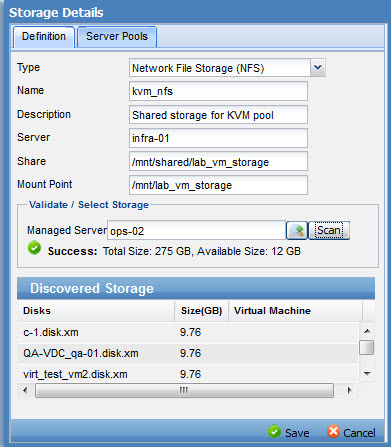 If successful, ConVirt will show total and available storage. 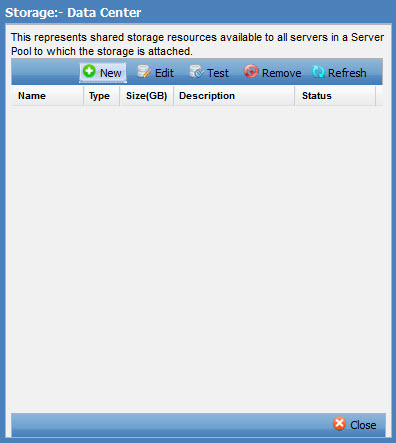 The last step is to identify which server pools will have access to this storage. Click on the Server Pools tab, select the appropriate pools, and click Save. 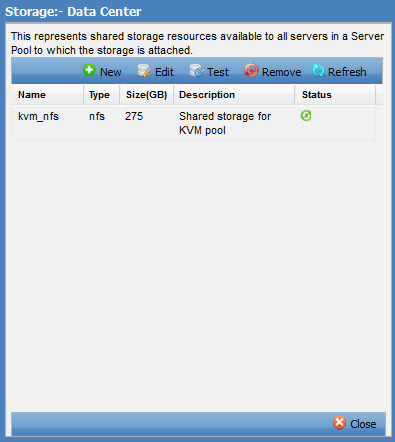 We have now created a new NFS storage resource, validated it, and shared it with selected server pools. ConVirt significantly streamlines the error-prone and time-consuming tasks of configuring your network resources, providing a centralized interface for managing your virtual networks. 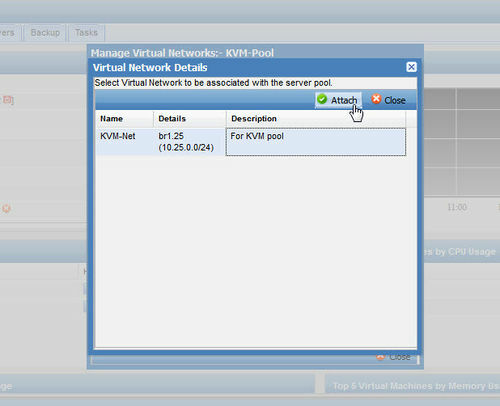 With ConVirt, you can centrally define your virtual network, attach it to your host server pools, then ConVirt automates the provisioning of the networks on all the hosts in the pool. 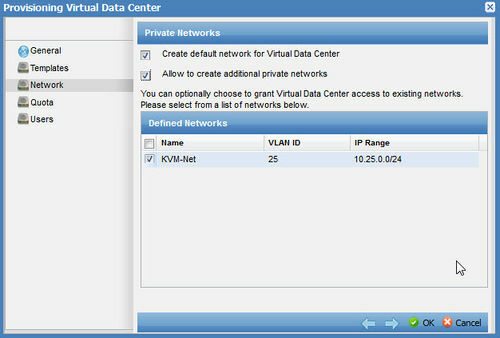 Lets create a new virtual network - we start selecting Manage Virtual Networks at the Data Center level. 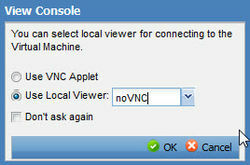 This brings up the Manage Virtual Networks dialog - select New. 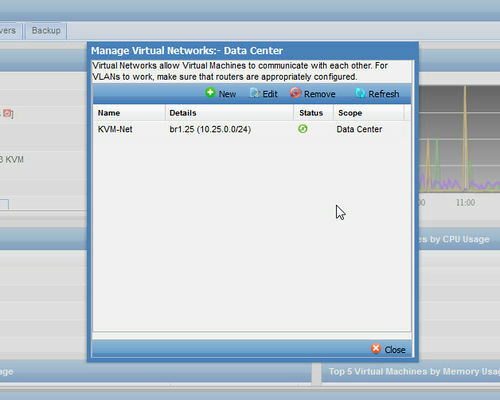 The New Virtual Network dialog box walks us through the process of configuring a new network resource. Fill in the appropriate network information for your environment. Note that the Ethernet name must be consistent across all machines in the network. 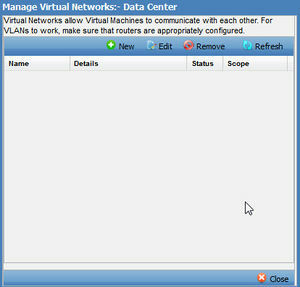 Click Save to create the new Virtual Network. We've now successfully defined our VLAN. Click Close. 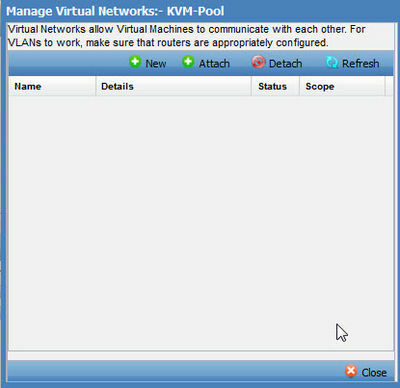 This brings up the Manage Virtual Networks dialog for the server pool - select Attach to see a list of networks available to this server pool. Select the network we just created and click Attach. 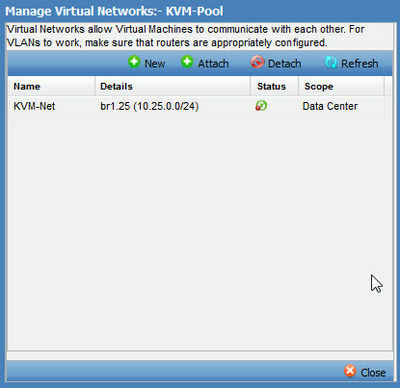 The dialog is updated with the new virtual network attached to this server pool. Click on the green status icon to view details about the new VLAN connection. ConVirt has the advanced automation and scalability features needed to run large scale or mission critical virtualization environments. 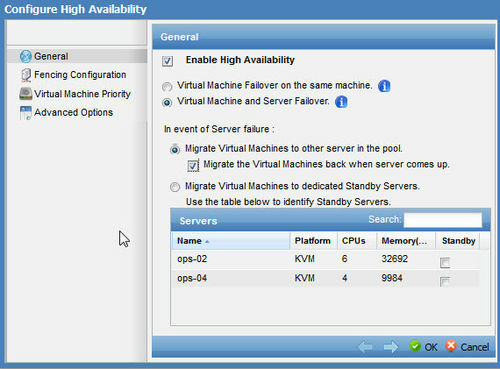 High availability provides failover services for both virtual machines and physical servers. ConVirt has built a unique, lightweight High Availability (HA) mechanism that lets you quickly configure HA for your server pools with an easy-to-use wizard within the ConVirt console. 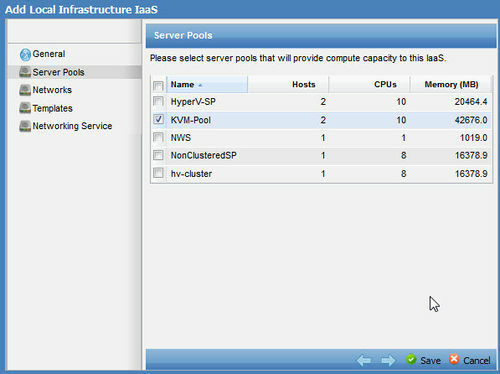 Once HA is enabled, ConVirt monitors all the virtual machines and physical hosts in a server pool, and handles automated restart of these resources in the event of a failure. 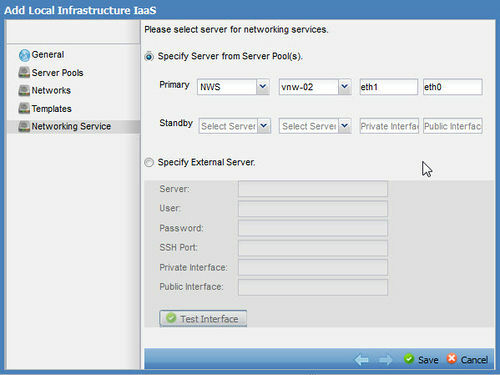 To configure HA, select a server pool in the Navigation Pane and select âConfigure High Availabilityâ from the right click menu. 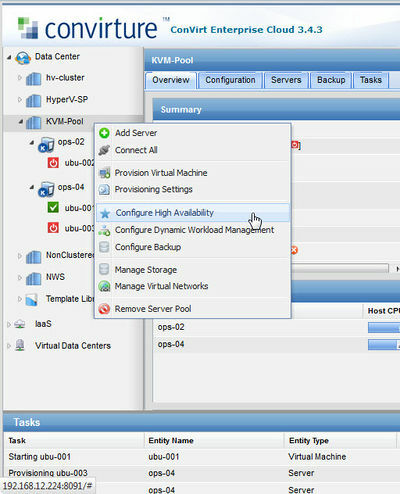 The Configure High Availability dialog will guide you through the process of setting up HA. 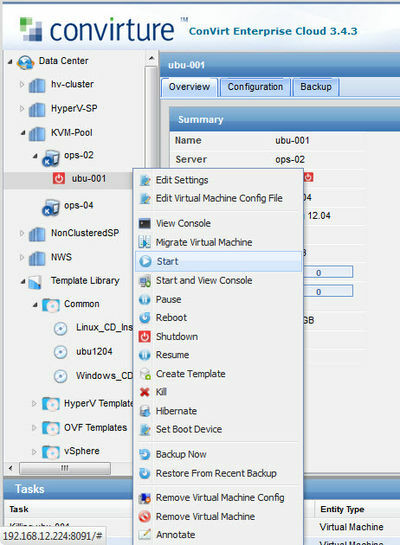 In the Fencing Configuration tab, you can set up fencing devices to eliminate the risk of the same virtual machine running on two physical servers. In event of a server failure, ConVirt will make sure that the server is indeed isolated/powered down so that virtual machines can be started on a different server. In absence of this there is a chance that the same virtual machine get started on two servers, causing corruption. The Fencing Devices dialog will come up, showing you what fencing devices are currently available. Click New. 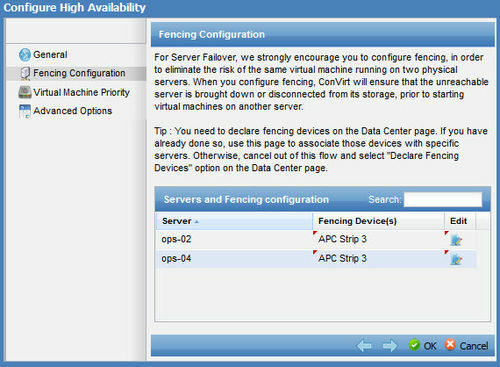 The Configure Fencing Device & Parameters dialog will come up, allowing you to define new fencing devices. 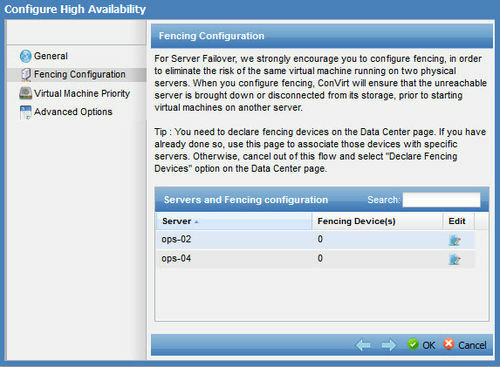 Configure a new fencing device, and click OK. The Fencing Devices dialog is updated with the new fencing devices for your host servers. 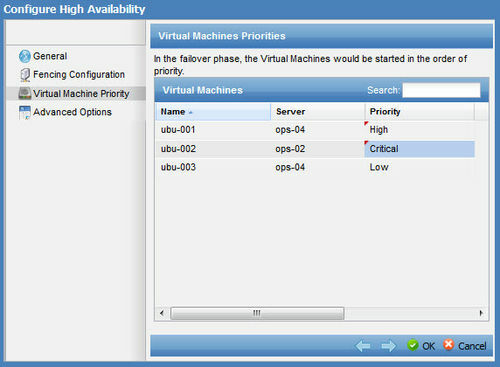 In the Virtual Machine Priority tab, you can set the priority order that VMs should be re-started. Set the priorities, then click OK.
You have just set up failover for your server pool by simply clicking a few buttons, without having to install anything on the hosts or build out a heavyweight Linux cluster. 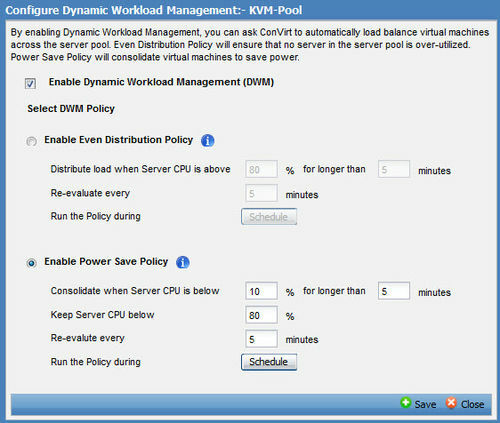 Dynamic Workload Management (DWM) allows the server load within a server pool to be managed using policies. 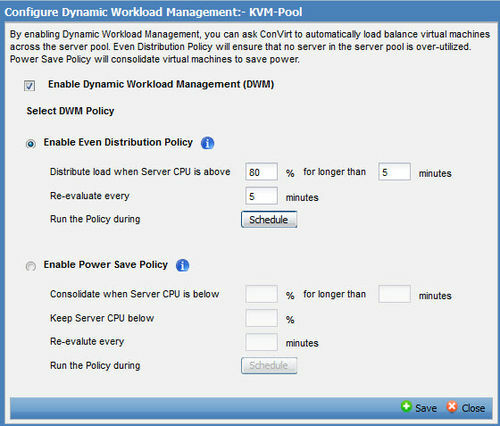 Based on these policies and their associated schedules, ConVirt will automatically migrate virtual machines between servers in a pool to achieve the policy goals. 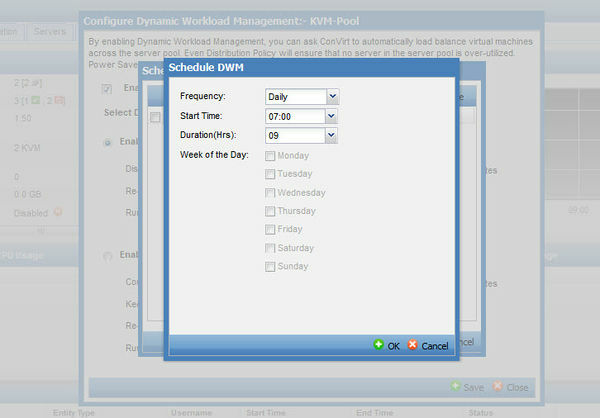 To configure DWM, select a server pool in the Navigation Pane and select âConfigure Dynamic Workload Managementâ from the right click menu. 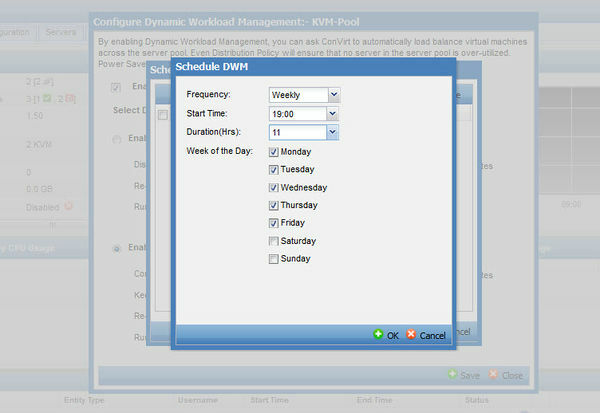 The Configure Dynamic Workload Management dialog will guide you through the process of setting up your policies. The Even Distribution policy ensures that no server in the server pool is over-utilized. The policy is configured using a threshold. When the Server CPU utilization reaches the threshold, the server is considered "loaded". 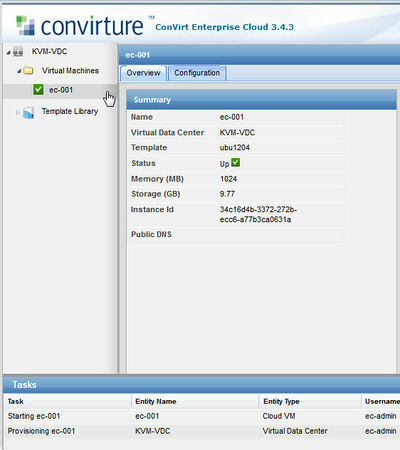 ConVirt, will move one of more virtual machines from that server to another suitable server. This, combined with ConVirt's Intelligent Placement, will result in an even spread of virtual machines across various servers within a server pool. Specify the thresholds and re-try times, then click Schedule. The schedule defines what time window the policy will be active. Specify the frequency, start time, and duration for the policy, and click OK. 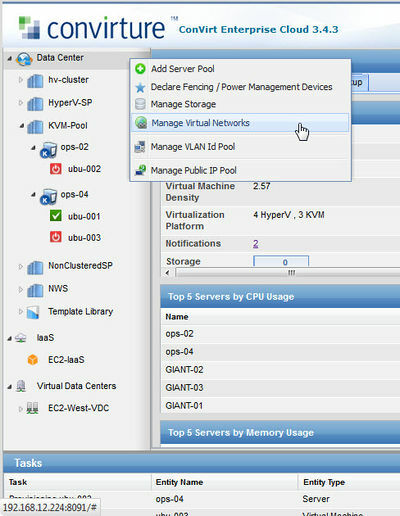 The Power Save policy consolidates virtual machines to a smaller number of servers to save power during low utilization periods. The policy is configured with 2 thresholds - one threshold determines when to kick off the consolidation process, and the other determines that maximum CPU utilization per server. For example, when the server CPU is less than 10 % for 5 minutes, ConVirt will try to move running virtual machines to another server. 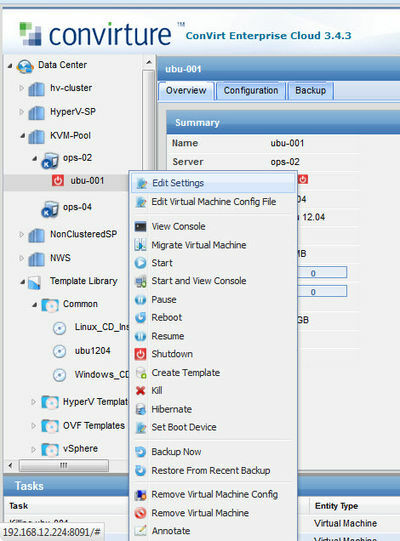 Once all virtual machines are moved, the server can be shutdown using already specified Power/Fencing configuration. The servers shutdown during Power Save would be started back up when the Power Save Policy ends according to the schedule. Servers will also be started when the server utilization on one of the consolidated servers goes beyond the upper threshold. KVM and Xen donât come with native backup and restore tools, so organizations have traditionally had to cobble together scripts and chron jobs to protect their data. 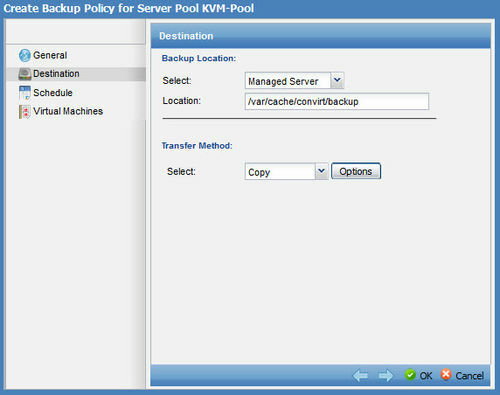 ConVirt Backup and Restore provides reliable, policy based backups for virtual machines across your server pools without the need for scripting or agents. 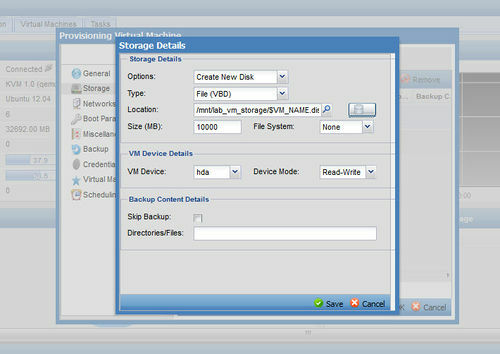 To configure Backup, select a server pool in the Navigation Pane and select âConfigure Backupâ from the right click menu. 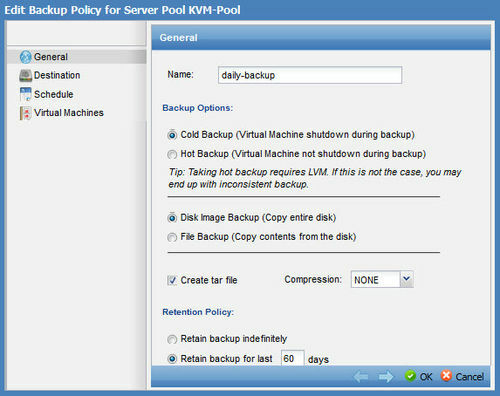 The Configure Backup dialog lists all the backup policies in place for the server pool. 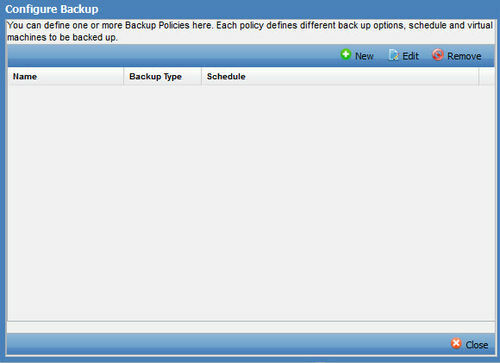 Click New to bring up the "Create Backup Policy for Server Pool" dialog. NOTE: Backup policies can be applied to individual hosts or groups of hosts, but they are managed at the server pool level. In the Schedule tab, configure the frequency and time for the backup to run. 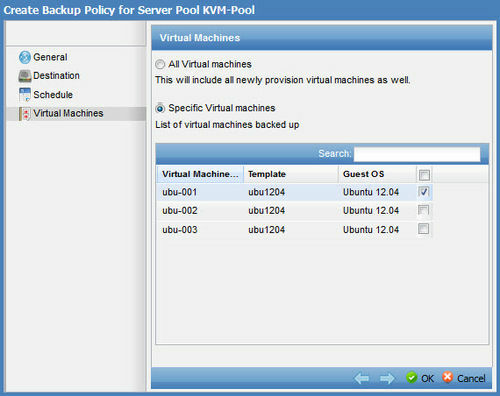 In the Virtual Machines tab, identify which VMs in the server pool should be backed up using the policy. Click OK to save the backup policy. 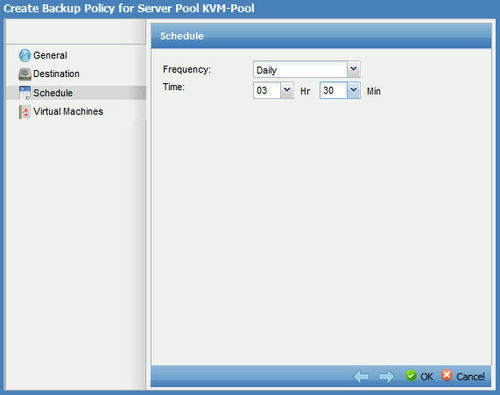 If you click on the server pool in the Navigation Pane, you can see the new backup policy in place on the Backup tab, including a the policies in place, backups completed, and backup failures. Now that we have a Backup policy in place, we may want to run it against the new VM we just provisioned, to get an initial backup in place. 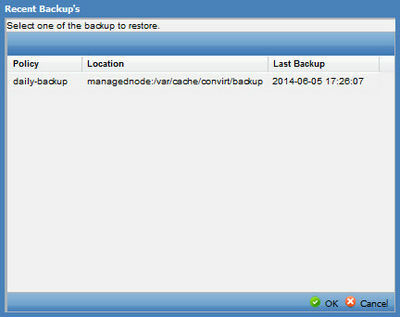 Right click on the VM and select Backup Now. 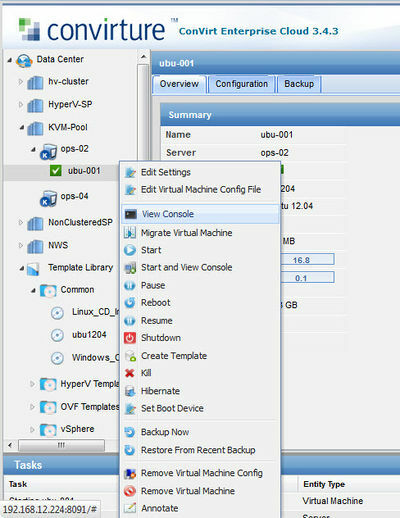 Confirm that you want to take a backup of the VM by clicking Yes. ConVirt submits a sequence of tasks (in the Task Pane at the bottom) to execute the backup policy, then records the results on the Backup tab for the VM. 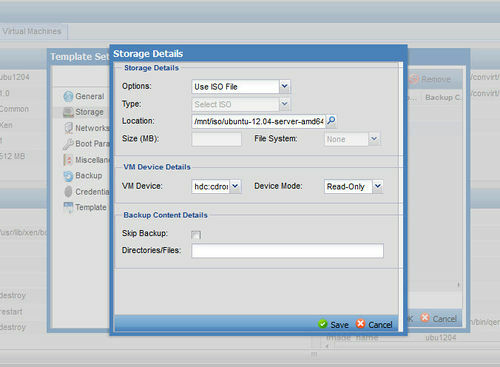 The final step in a complete backup solution is to restore a backup. 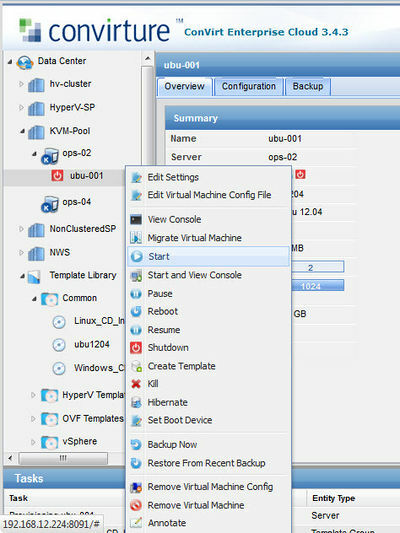 With ConVirt, you can do this from several places - from the Backup tab for the Server Pool or VM, or by right-clicking on the VM. Confirm that you want to restore the VM by clicking Yes. 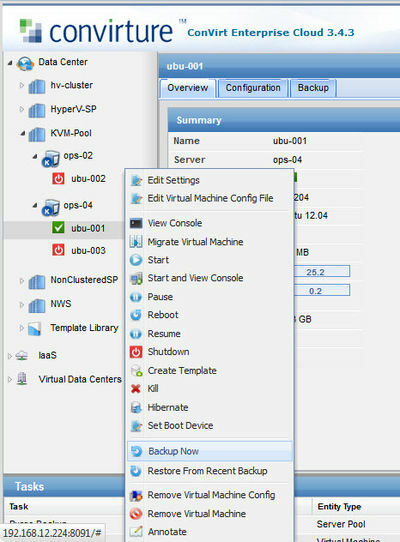 Select which backup you would like to restore and click OK.
ConVirt submits a set of tasks to shut down the VM and restore the selected backup. During the course of operations, host servers periodically need to be brought down for hardware or software maintenance. During these windows, the management application should "ignore" the host. With ConVirt, you can put a host into Maintenance Mode, and it will be ignored for automated provisioning or migration tasks including Intelligent Placement, High Availability, and Dynamic Workload Management. ConVirt also automates the migration of current workloads to other hosts before entering Maintenance Mode, and optionally bringing the workloads back after leaving Maintenance Mode. Right click on the host server, and select Maintenance to bring up the Server Maintenance dialog. 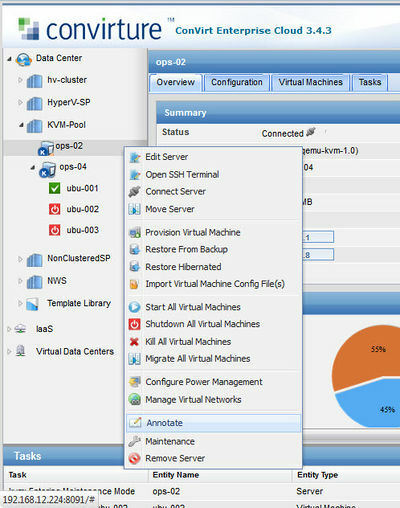 Check the box next to Maintenance, and select the appropriate option for handling VMs on the host when you put the server into maintenance mode. Click OK to put the server into maintenance mode. 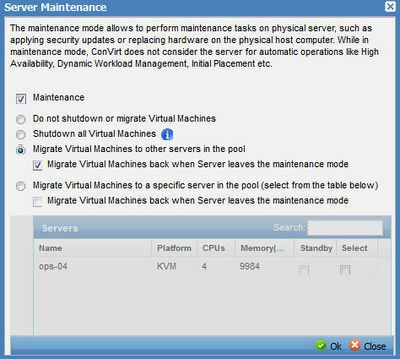 ConVirt places the server into maintenance mode (indicated by the yellow indicator on the host icon), and migrates any VMs per the maintenance policy. In this example, note that VM ubu-002 was migrated to the other server in the pool. Annotations are a quick way of communicating with your colleagues who may also be working on the infrastructure. You can set an annotation on a host or a virtual machine. This helps improve coordination and prevents multiple people from working on the same issue. It also keeps others updated about progress. Annotations are sent as email notifications to everyone that can view the entity. In the Annotate dialog, enter your message and click Save. 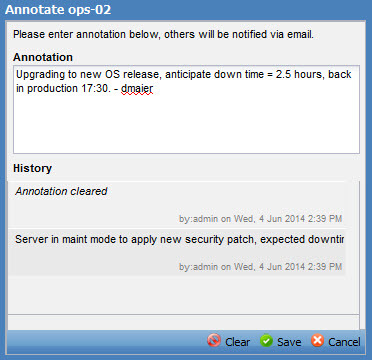 An Annotation icon will show up in the Summary pane of the Overview tab, indicating that there is a message available for that host or VM. Click the Annotation icon to open the message. ConVirt makes it easy to give your business unit and customer administrators access to data center virtualization resources with an easy-to-use, lightweight self-service capability that overlays your existing virtualization - no new infrastructure required. You simply delegate compute resources to your business customers, and they provision and manage the compute resources via a web-based self-service console. Public Network : to make virtual machines available on the public network. 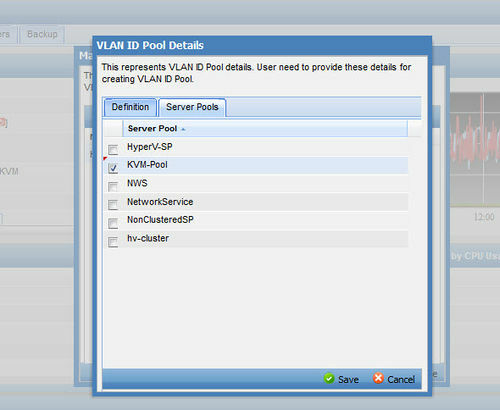 VLAN ID pool - a set of free VLAN IDs. Public Network : This is a public/internet facing network. 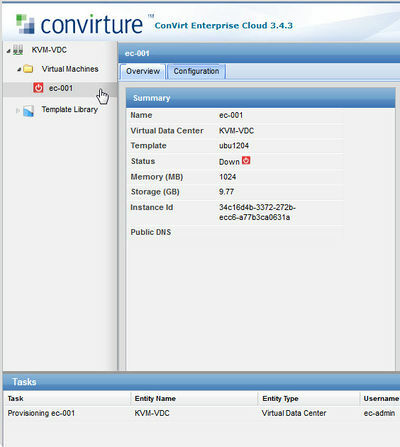 ConVirt will use the interface identified for this network for making virtual machines available on the public network. For larger scale production deployments, these networks would each be set up on their own physical network. For the purposes of this guide, we will use the same physical network to support both the Management and External/Public networks. In addition, while the Network Service can be run on an external server or on a VM, for this guide we will designate one VM to run ConVirt's Network Service. 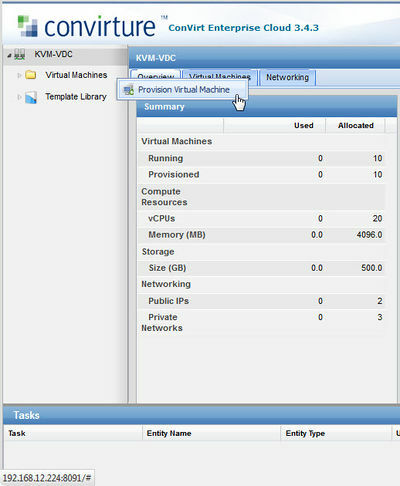 Make sure the type is "KVM"
You should see the virtual machine added as a host under the new server pool you created. ConVirt creates private virtual networks for isolation. One such network is created each time a new self-service Virtual Data Center is provisioned. In addition, ConVirt has the capability to allow users to create their own private networks. 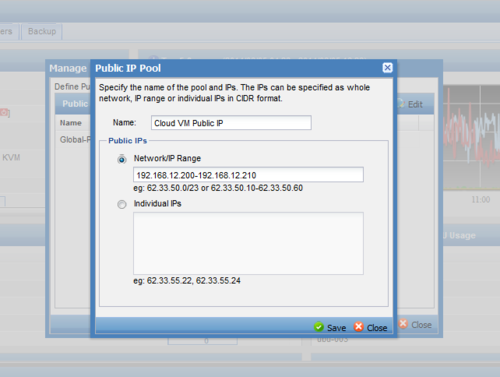 To do this, ConVirt requires a VLAN ID when such a private network is created. 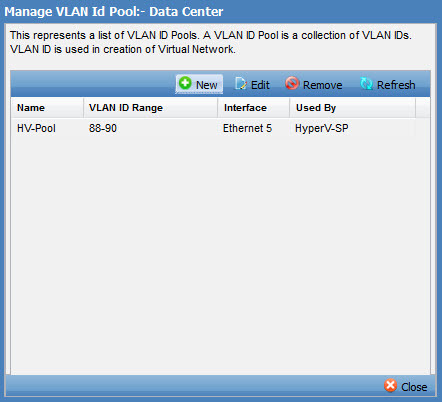 For convenience, a VLAN ID Pool needs to be declared. 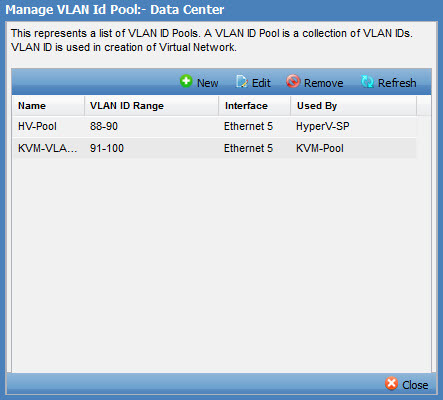 In the VLAN ID Pool Detail window on the Definition tab, provide the appropriate details. 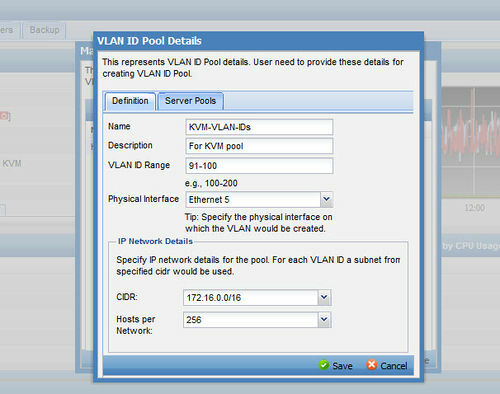 In the VLAN ID Pool Detail window on the Server Pools tab, select the server pools for which these VLAN IDs will be available, and click Save. 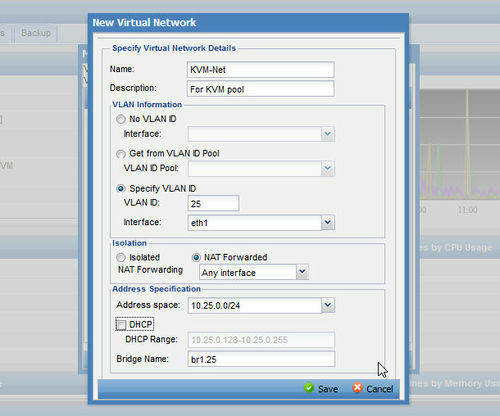 You've now created a pool of VLAN IDs that you can use to provision self-service Virtual Data Centers. ConVirt enables self-service Virtual Data Centers to optionally make their virtual machines accessible over the Internet by assigning a public IP address. To do this, you define a Public IP pool, and then assign Public IP quotas to Virtual Data Centers. Self-service Virtual Data Center clients can then request a Public IP, assign it to a virtual machine, and release it back into the Public IP pool. 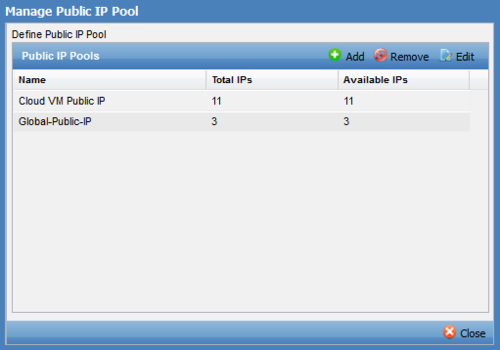 This brings up the Manage Public IP Pool dialog showing the available pools. Click Add. 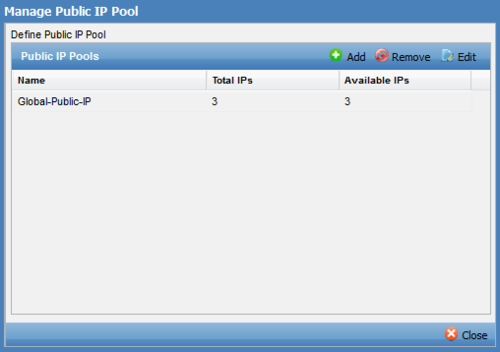 In the Public IP Pool dialog, specify the name of the pool and the IPs, then click Save. 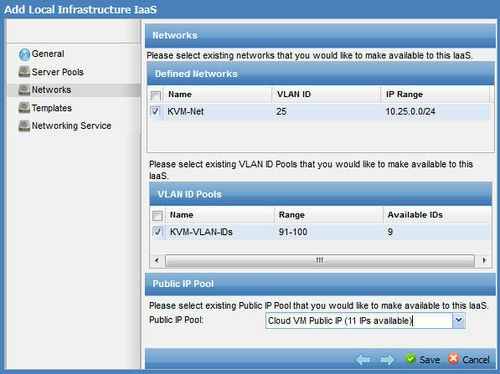 The Manage Public IP Pool dialog is updated to show the new pool. The first step in adding self service is to convert your virtualization infrastructure into a local cloud. 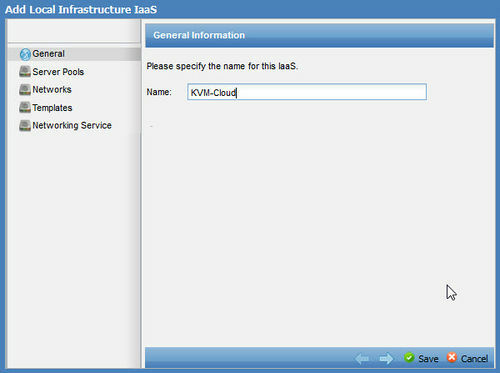 To do this in ConVirt, an IaaS entity needs to be defined. 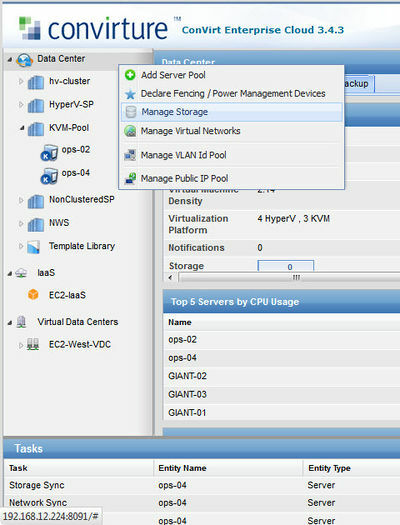 With a few simple clicks, ConVirtâs IaaS wizard allows you to designate which parts of your existing infrastructure (server pools, networks, storage, and templates) should be used for the cloud deployment, then generates the IaaS. The type of cloud we're going to create uses "Local Infrastructure"
This brings up the Add Local Infrastructure Iaas dialog - put in a name and description of the cloud you want to create. Select your networking service, then click Save. ConVirt will orchestrate your local resources together into an Infrastructure-as-a-Service cloud. Note that the Ethernet name must be consistent across all the machines in the server pool. 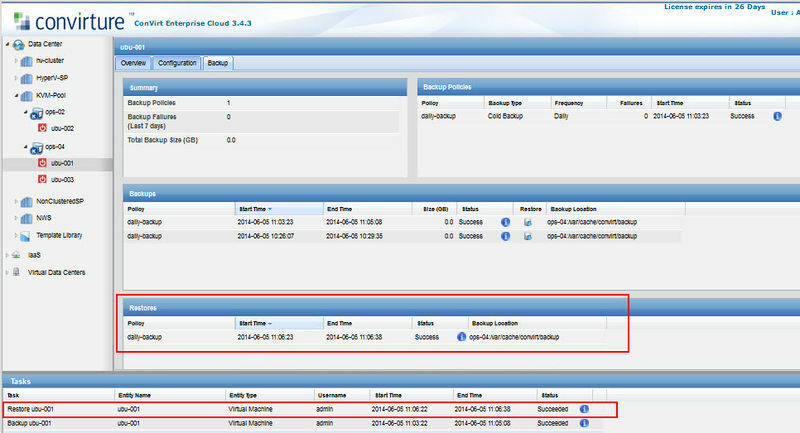 The new cloud should show up in the IaaS area of your navigation pane. The next step in adding self service is to delegate some of these IaaS resources to your business customers. To do this in ConVirt, you create a Virtual Data Center (VDC), which allows customer administrators to use the IaaS cloud capacity without knowing any details about the underlying physical infrastructure. 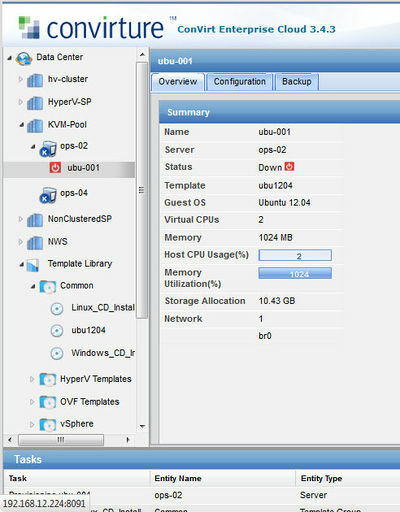 With a few simple clicks, ConVirtâs VDC wizard allows you to define the compute, template, storage and networks resources that will be made available, the quota limit for each resource, and the authorized users/administrators of the VDC. 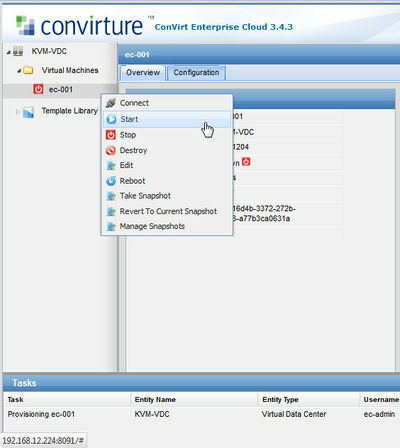 ConVirt automatically assembles the VDC based on your selections. 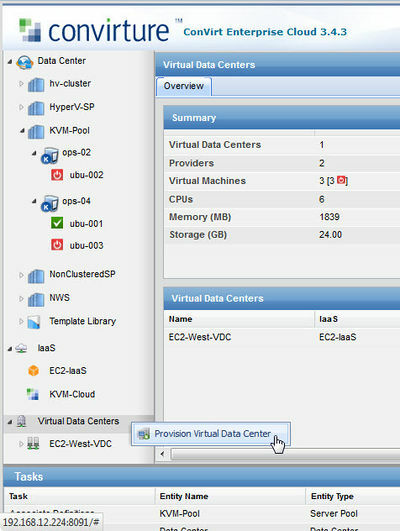 Right click on Virtual Data Centers, and select Provision Virtual Data Center. Next you choose the cloud resource you'd like the self-service console to use. 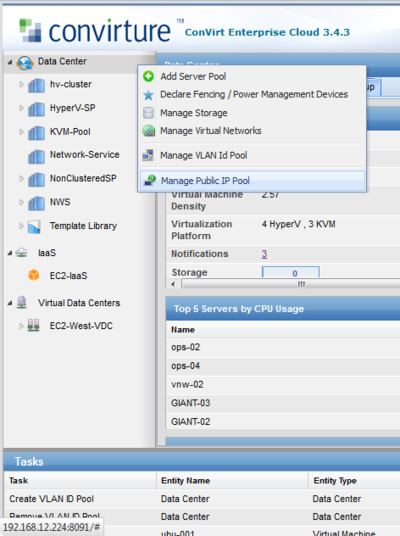 Note that you can have multiple Virtual Data Centers utilizing a single IaaS cloud. Select the cloud you just created and click OK. 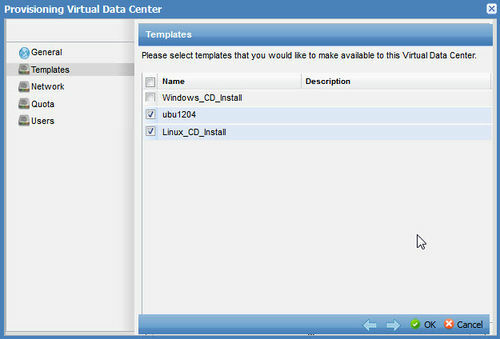 The Provisioning Virtual Data Center dialog should pop up, to walk you through the self-service definition. Type in an appropriate name and a description. Select the templates you would like to make available via the self-service console. Note - the templates will be limited to what is available via the cloud resource you are using. Select the network resources you would like to make available via the self-service console. Define the resource quotas for the self-service console. 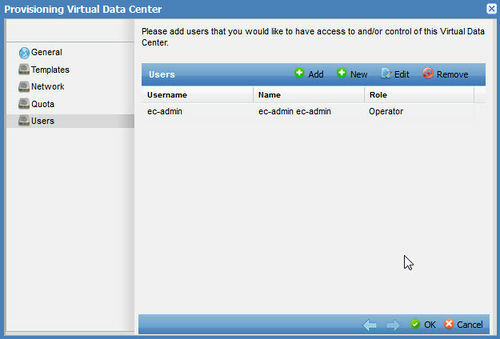 ConVirt enforces these quota limits so that users of the self-service consoles cannot go beyond the limits you set. And finally, create or assign the administrator(s) for this self-service console. 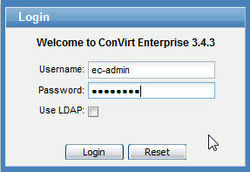 Note that you can assign existing users who were already defined as ConVirt admins, or you can integrate users from your LDAP or Active Directory, or you can create new users. 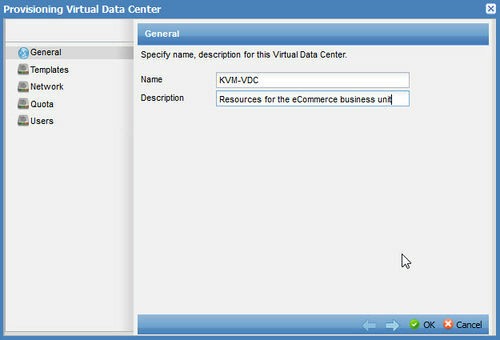 Click Save to create the self-service Virtual Data Center. You will receive a confirmation alert. 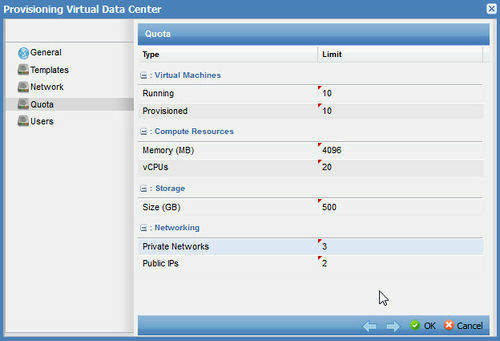 The new self-service console will show up under the Virtual Data Center section of the navigation pane. You can see the quota information in the Summary tab on the right. Once the Virtual Data Center (VDC) is created, authorized users/administrators will be able to access and manage the environment from ConVirt's web-based console. Users/administrators are able to do things like create Virtual Machines; create networks (if configured at the time of VDC creation); start, stop and connect to Virtual Machines; delete/destroy Virtual Machines; and reserve a public IP address and associate it to a Virtual Machine. Open a different browser, and log in to the ConVirt Management Server using the self-service user credentials you just created. What comes up is a version of ConVirtâs web-based console that shows only the resources that are authorized to be used in this self service environment. In this self service environment, you have access to all the controls that ConVirt provides - the only limits are on the resources you can access. 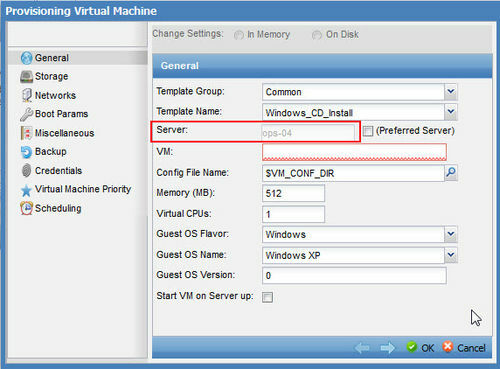 So lets go ahead and provision a virtual machine - right click on the Virtual Machines folder and select Provision Virtual Machine. Type in a name for the virtual machine you'd like to create, select a template to use, and click Save. 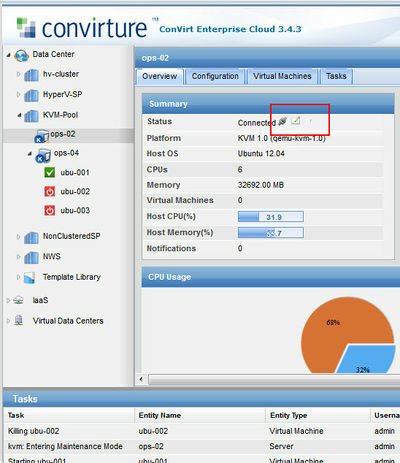 ConVirt provisions the new VM. Next lets start the virtual machine - right click on it and select Start. ConVirt starts the new VM. Now lets view the console for the new VM - right click on the VM and select Connect. ConVirt prompts you for the local viewer you would like to use to connect to the VM. 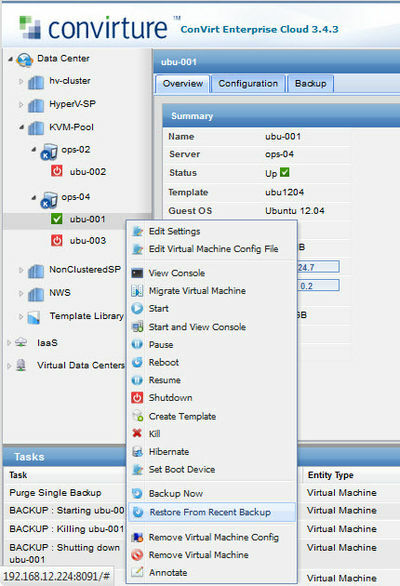 The console window opens and you can get to work on your VM.